My paintings: Erin Gray – Nerdwatch! A long time ago, back in the early days just after the Earth cooled, about half-past the dinosaurs, I used to paint pictures. This being the dim and ancient past, these were done with acrylic pigment on actual canvas, and they took a long time each to paint. Mainly because there wasn’t an “undo” function. I wasn’t half-bad at painting these, I don’t think, but I haven’t digitized them in a long time, so I’m going to display them here on my blog, as I get to them. 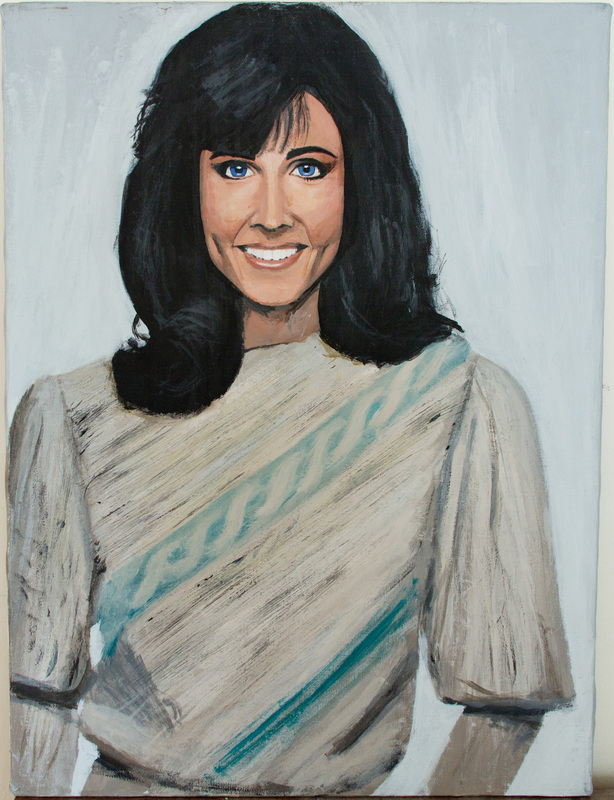 This one is a painting I did of the actress Erin Gray, who at the time (the 80’s, you may have heard about it from your parents or grandparents) was starring in a TV show called “Silver Spoons”. She was interviewed in an edition of “TV Guide” magazine, and the article was accompanied by a very beautiful photo of Ms. Gray. I usually based my paintings on photographs of beautiful women as I came across them, so I don’t actually “create” the art, I pretty much copy it in a larger format, in a different medium, with whatever skill I can muster. Not every one works well, and I probably won’t display the ones I’m not so happy with, but then again I might inflict them upon the unwary Internet! (cue evil chuckle). At any rate, this is a photo I took of the painting, with some correction for the distortion of the camera lens. If you like it or hate it, please comment. Tagged acrylic painting, actress, beautiful women, beauty, Erin Gray, painting, photograph. Bookmark the permalink. Nice. And you received a response from Ms. Gray. WOW!